We launched our Sunday Suppers tradition last weekend with an absolutely delicious braised chicken dish from none other than “Sunday Suppers at Lucques” by Suzanne Goin. Granted it was prepared and served on a Monday, not Sunday, but it was a holiday. Still counts, right? Dear friends joined us for the meal and it was beloved by all, including the little ones. I loved this recipe for so many reasons and wanted to share it with all of you. First of all, for a restaurant-quality main course, it was surprisingly low-key to make at home. This adapted recipe will hopefully smooth out the kinks I experienced and make it even simpler. Second, no one can argue with the ease of braising – provided you have a large ovenproof pot and a bit of time, you are guaranteed to end up with a tender, deliciously moist result, especially if you use legs and thighs. Our family is slowly learning to love dark meat, and this recipe is sure to become a standard in the repertoire. More importantly, thighs and legs are the most affordable cuts of chicken, especially when compared to boneless/skinless breasts. This makes buying organic or sustainably-produced options that much easier. Here is more information on why it is so important to buy sustainably-produced chicken and how to do so without breaking the budget. 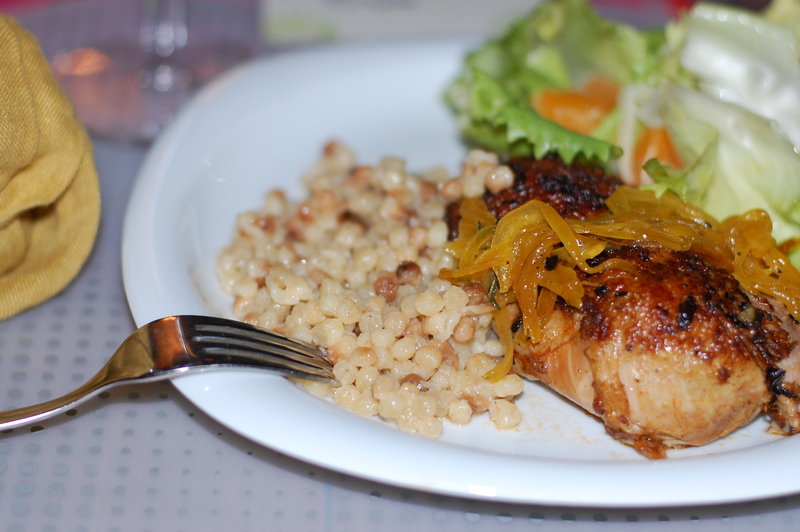 I served the chicken alongside the Italian couscous suggested in the original recipe, which was an interesting but not beloved choice. 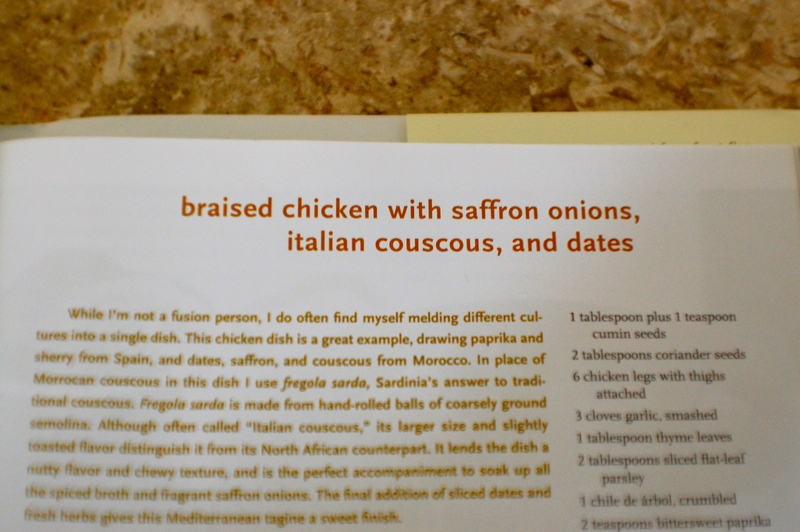 I would stick with a regular cous cous, which will be a perfect compliment to the Moroccan-inspired flavors. Add a vegetable side dish (I made a chicory salad with fennel, toasted almonds and satsuma slices) and you’re all set. THIS RECIPE REQUIRES DAY-AHEAD PREP: Be sure to read through the recipe entirely before proceeding. It will make the cooking process much faster and easier. The chicken needs to be braised for about 1.5-2 hours but working backwards from the time you want to serve dinner, you should start roughly 2.5 hours prior, and spend about 15 minutes prepping the night before. Gently, in a small dry pan, toast the ground cumin and coriander until fragrant. 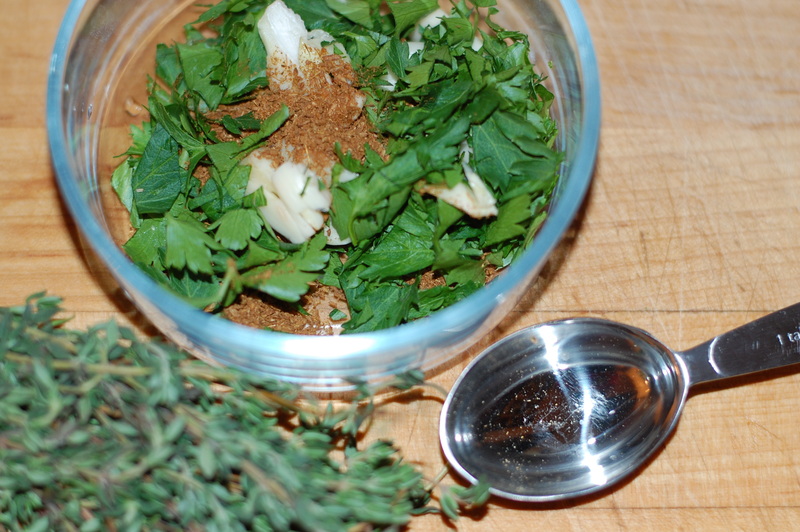 Place in a large bowl and add the chopped garlic, parsley, thyme, chiles, and paprika. 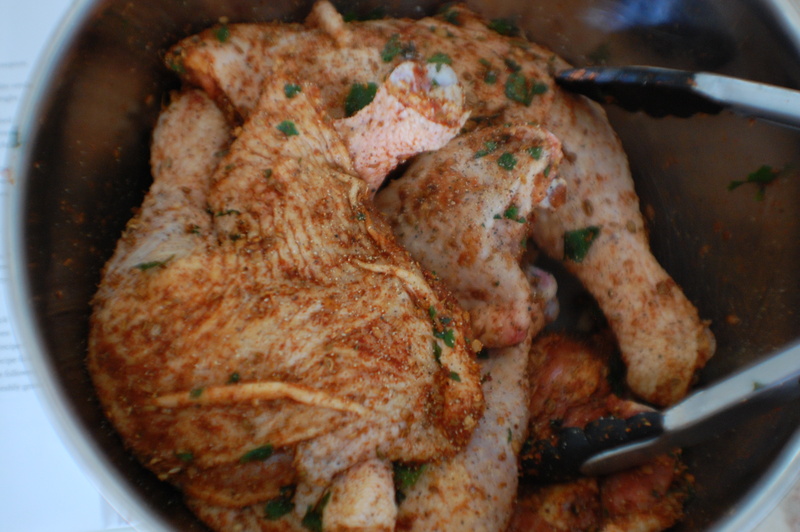 Toss the chicken and spices together with your hands or tongs, then cover and refrigerate until the next day. Remove the chicken from the refrigerator and allow it to come to room temperature. Season the chicken generously with kosher salt and black pepper. Heat large sauté pan for a few minutes then swirl in a few tablespoons of olive oil. Place chicken legs skinside down in the pan and cook on medium-high heat for about 5-7 minutes, until golden and crispy. This may have to be done in batches if your pans, like mine, are on the smaller side. Flip chicken over, reduce heat to medium and brown the other side for 2-3 minutes. Arrange the chicken in one layer in an oven-safe braising dish or cast iron pot. The legs should fit snugly in the pan. Pour off some of the chicken fat or starting with a clean pan and olive oil, heat the pan at medium heat and add the sliced onion, fennel and bay leaves. Cook 6-7 minutes, until the vegetables are somewhat caramelized. Add the tomatoes and cook another 5 minutes, stirring and scraping along the way. Add the sherry vinegar, sherry, and white wine. Turn up the heat to high and reduce/boil off the liquid by about half. Add the chicken stock and bring to a boil. Toss in the cilantro and remove from heat. Pour the broth and vegetables over the chicken. The liquid should not quite cover the chicken. If you have leftover broth, congrats. I found it makes for a delicious light soup snack! Cover the pan with aluminum foil and a tight-fitting lid. Braise in the 325° oven about 1.5 hours. When done, the chicken will be tender but not quite falling off the bone. Turn oven up to 400º. 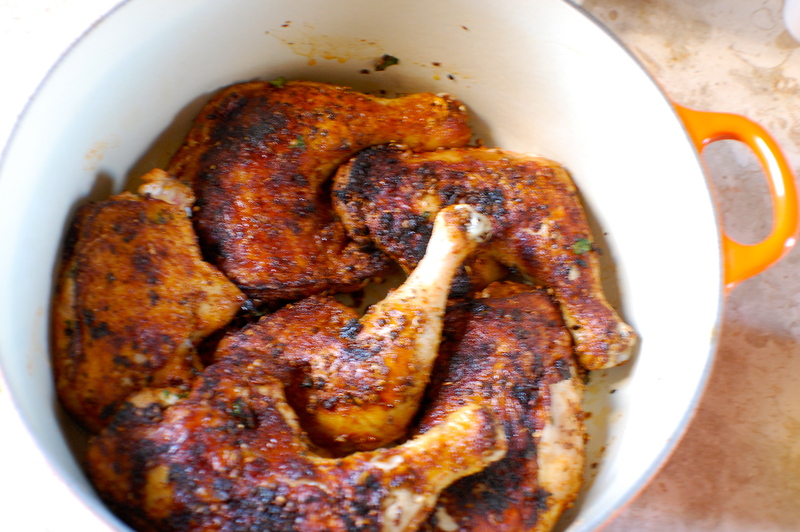 Arrange chicken legs on a baking sheet and brown in the higher-temperature oven for about 10 minutes. In the meantime, strain the broth into a saucepan and reduce (cook down) it on medium-high heat for about 5 minutes to thicken it slightly. This “chicken sauce” was a huge hit. It’s worth taking a few extra minutes to do this step. Serve alongside cous cous/small pasta/other favorite grain and vegetable. Enjoy! I just bought this cookbook and this recipe looks like a winner. Thanks for the prep tips. Very helpful! BTW, we are really enjoying our Sunday suppers. Thanks for the inspiration.